A Cry in the Night (1956) is an unusual thriller, standard in construction, but uncommonly warm with compassion. 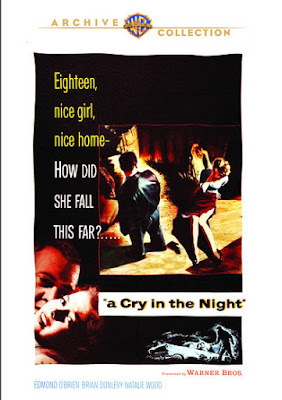 Now available on DVD from Warner Archive, this efficiently-paced production of Alan Ladd's Jaguar Productions marks an interesting transition for its stars, Raymond Burr and Natalie Wood. These established performers are seen here on the verge of developing new, powerful aspects of their personas. Wood is Liz Taggart, the daughter of a police captain (Edmond O'Brien). While she canoodles with her secret fiancée Owen (Richard Anderson) one evening on Lover's Loop, the mentally unhinged, mother-obsessed Harold Loftus (Raymond Burr) watches from the bushes. You only get the slightest portrait of Liz before she finds herself abducted by Harold, and Owen knocked unconscious by her kidnapper. Owen is picked up by the police, and when he is fully conscious, he introduces himself to his future father-in-law (Edmond O'Brien) in the worst possible setting. While Harold holds Liz captive, Captain Taggart works with the night shift police captain (Brian Donlevy) and Owen to find his daughter. I found myself drifting during the police procedural scenes. Brian Donlevy and Edmund O'Brien are always reliably good, but they haven't got much to work with here. Their lack of engagement with the material makes their quest seem oddly without peril. The situation should be a nightmare for a father, but somehow the horror never fully connects with O'Brien. Donlevy seems similarly distant, if still seriously focused on the matter at hand. Wood and Burr produce a more riveting tension, both of them unsettled by their own personal issues in addition to the situation at hand. Something tells Liz to not be completely afraid. She keeps her mind on self preservation, and recognizes that she is in danger, but she doesn't panic. It is as if she feels a slight kinship with this disturbed man. A woman who hides her romances from her family is not free. Perhaps she sees herself in her captor. This film would mark a transition for the pair. The following year, Burr would leave behind the creeps he played for the bulk of his early career and find his defining role on television as Perry Mason. Following her role as a conflicted teenager in Rebel Without a Cause (1955), here Wood tackles her first truly grown up part and hints at the darker tone to come in the characters she'd portray in later films. The pairing of Wood and Burr works because they are so deeply in touch with their own vulnerability. You can still hear the warm warble of the child actress Wood in her voice, and this offsets her determination to establish her power, both with her captor and her family. Burr is similarly complex, big, burly and threatening, but also lonely and frightened by the hold his mother has over him. His performance occasionally threatens to veer into camp, and it is his understanding of this man's fear that keeps it from going too far. I hope this little flick finds a wider audience, if anything so that fans of these actors can appreciate the deeply sympathetic and highly-charged relationship Burr and Wood portray so movingly. I mean, it's not going to rock your world, but yes, the interaction between Burr and Wood is fascinating. They are simpatico in a unique way.